Aggressive individual stock traders often shy away from these stocks because of the perception that such stocks are unlikely to produce the same high levels of growth that are available through some more volatile small-cap and micro-cap stocks. However, it will appear below that this perception is not always accurate. Clearly, some Dow 30 stocks do outperform many smaller cap stocks on the other major indices. Table One above shows the nine-week price appreciation of each of the Dow 30 stocks from the December 31, 2018 closing price to the March 7, 2019 closing price. Stocks are ranked from top to bottom for highest-to-lowest gains, and they are grouped by highest, middle, and lowest thirds. It is immediately apparent that 11 of these stocks have shown double-digit growth in just nine weeks. Many aggressive traders would be happy with that performance. Boeing Co. has even registered 31.78% growth over the same period. Very few aggressive hedge funds can compete with such performance. It follows at this point that selective purchases of Dow 30 stocks can produce outstanding portfolio gains. Another concern of Dow-30 investors is the rate of annual dividend payout. Some investors base stock purchasing decisions entirely on the size of the annual dividend payout. They no doubt have their own reasons for such action, but as Table Two below illustrates, this may not always be a wise procedure. You can see that Table Two reports 2019 annual dividend payout for the Dow 30 stocks. Highest-to-lowest dividend payout is ranked from top to bottom, and stocks are grouped into highest, middle, and lowest thirds on size of dividend payout. Note that International Business Machines offers the highest dividend payout - 4.64%. Visa offers the lowest dividend payout - 0.68%. The casual observer will now rush out and buy IBM. But wait! We can see in Table One that, apart from IBM, most of the stocks in the highest dividend group are in the lowest to middle year-to-date growth groups. One might conclude from this that offering a high dividend is generally associated with low growth. Perhaps a high dividend is even a net drag on growth. Further, the highest dividend potential is only a small fraction of the highest growth potential. Therefore, if the object is to maximize gains, it is much more critical to attend to growth than to attend to dividends. Some stocks in the highest dividend group, like Coca-Cola, Pfizer, and Walgreens, actually had negative growth in the period observed. Going for a high dividend with those stocks would have been counter-productive. The conclusion here is that it is better to focus on growth potential than to focus on dividend potential if the object is to get highest gains overall. To this point we have been focused on past performance or upon promised dividends. This may have little to say about how the stocks will perform in the future. Future expected performance is much more important to investors than is past actual performance. Making accurate estimates of future growth is a difficult, but not impossible, task. To succeed one must find some reliable indicator(s) of future growth. It is a well-known fact that momentum is among the best precursors of future growth. Often investors follow the crowd. There is frequently a kind of crowd psychology that pushes stocks higher or lower according to a prevailing trend. The problem is that there are several different ways to measure momentum that yield differing results. Also, the time window is a concern. For some stocks, momentum lasts only a few days after a positive earnings announcement. For other stocks, momentum may continue for several months or years. Therefore, it can be beneficial to examine momentum using a variety of indicators. For purposes of this study, I am reporting momentum on Dow 30 stocks by using three different indicators of momentum; i.e., the relative strength index (RSI), the bounce/lag momentum index (B/LM), and the regression residual index (RES). Finally, using an unweighted combination of momentum rankings, I am reporting a combined ranking according to the three separate methods. Before we look at the momentum rankings in Table Three, let me provide a brief explanation of the three momentum indices. 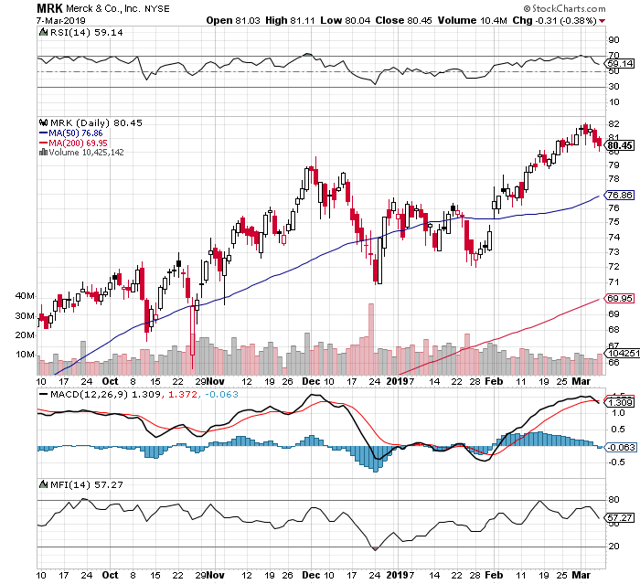 The first index is called the relative strength index (RSI). It is a well-known momentum indicator that measures the magnitude of recent price changes, usually over a 14-day interval, in the price of a stock or other asset. The RSI is displayed as a line graph oscillator that moves between the extremes from zero to 100. This indicator was developed by J.W. Wilder and introduced in his 1978 book, New Concepts in Technical Trading Systems. Traditionally, RSI values of 70 or above have been interpreted to indicate an over-valued or over-bought condition. Whereas, RSI values of 30 or below are thought to be suggestive of an under-valued or over-sold condition. The second momentum index is known as the bounce/lag momentum index (B/LM). This momentum indicator combines two important variables (bounce and lag) to determine the comparative annual upward trajectory of a stock or index (bounce) and the proximity of the stock or index to its 52-week high (lag). The first variable indicates rate of ascent, and the second variable shows whether that ascent is still intact. This indicator was developed and first reported in my books, The Value and Momentum Trader (2010), and, Trading Stocks by the Numbers (2015). Its simplest formulation is just the ratio of percentage bounce above the 52-week price low divided by the percentage lag below the 52-week price high. The third momentum index is here called the regression residual momentum index (RES). Regression analysis is a well-known statistical procedure based on the correlation between two normally and independently distributed variables. It is used to make predictions on one of those variables (the dependent variable Y) related to movements of the related variable (the independent variable X). In this case, the attempt is made to predict “bounce,” as defined above, on the basis of “lag,” as also defined above. Once a regression line is constructed, it is possible to examine prices of all stocks to find those prices that show greatest departure from prediction. These departures are known as “residuals.” The stocks with greatest over-estimating residuals have been found to be those stocks with greatest momentum. This application of residual analysis is also first reported in my books cited above. Now let’s look at these momentum indicators for the Dow 30 stocks. Notice in Table Three that all three of the selected momentum indicators (RSI, B/LM, and RES) are reported for each of the stocks in the Dow 30. Next, ranking statistics are computed for each stock on every indicator (RSIr, B/LMr, and RESr). Finally, the ranking indicators are combined as unweighted combined ranks to compute an overall combined indicator of momentum (COMr). Stocks in Table Three are presented in descending order from highest to lowest combined momentum, and are then grouped into highest, middle, and lowest thirds. You can see that the two stocks with the greatest momentum by far are Merck and Boeing. Interestingly, Boeing is also the stock with the greatest year-to-date percentage gain reported in Table One. It appears from this finding that momentum is still very much intact for Boeing in spite of the fact that it has shown the greatest year-to-date growth. Boeing is also in the lowest dividend payout group, so one might conclude that it does not suffer from dividend-payout drag on growth. I interpret this to mean that Boeing is currently an attractive acquisition. Note that Merck is currently experiencing even greater momentum than Boeing. In Tables One and Two you can seek that Merck is presently in the middle growth and in the middle dividend-payout groups. It would appear that it too has much potential for future growth. This potential may be associated with its membership in the hot bio-pharmaceutical sector. It also appears to be an attractive stock for acquisition. Because these two stocks show highest current momentum, it is useful to look more closely at their performance charts below. You can see from this chart for Merck & Co. that its price has shown steady upward momentum, apart from a pause between December and February that may have been related to overall market decline. Relative strength (59.14) is not overextended. You can see also that the money flow index (57.27) is slightly below the value of the relative strength index. This tells us that the stock may currently have positive room to run. The recent decline in the price is probably associated with overall market decline, and therefore does not diminish the comparative status of this stock among other Dow 30 stocks. In the Table for Boeing presented above, you can see a very positive pattern of upward price movement. The RSI (60.62) is again comparatively high, but not excessive. In the case of this stock also, money flow (58.19) is slightly below RSI, which is a positive observation. This suggests that the stock clearly has room to run higher. The recent decline is price appears to be associated with an overall market decline, and does not alter this stock’s comparative high standing among the other Dow 30 stocks. The jury is still out about where overall equity markets may go from here. 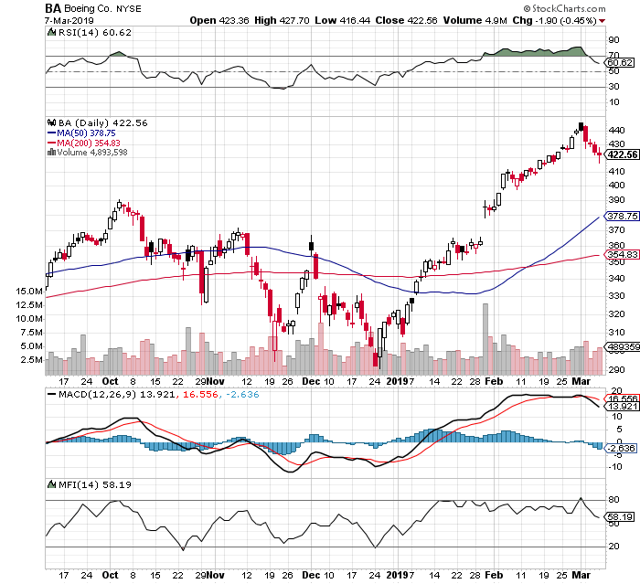 The comparative momentum indicators for both Merck and Boeing are highly positive and encouraging. Also, the money flow index for both of these stocks being below the relative strength index is a positive sign of a buying opportunity. As overall market conditions strengthen, these stocks should do well for the foreseeable future. It will be useful to continue to compare all of the Dow 30 stocks regularly using these barometers.